I loved Peri Reed’s debut in The Drafter last year — it was one of my 10 favorites of 2015, so to say I was eager to read this is somewhat of an understatement. Sure, I was a little apprehensive, too — could Harrison pull it off again? Thankfully, yes she could. You may be able to jump in to the series with this point, but I really wouldn’t recommend it at all. Go read The Drafter. The Operator picks up with Peri in a much better place (mentally, at least) than we left her in — she’s living out of the business, she runs a coffee shop that’s marketed towards the elite of Detroit — the moneyed, those wanting the most secure networks while sipping their morning caffeine fix, and those willing to spend an exorbitant amount on coffee. She’s working really hard to convince herself that this is the life she wants when her past catches up with her. And before she knows it, she’s got the remnants of Opti trying to bring her back in — and the government’s version of a “clean” Opti doing their best to recruit her (and honestly, they’re taking more of a “stick” approach than a “carrot” approach). Faces from her past — those she trusts, but not enough; those she trusts, but doesn’t want to; and those she’ll never trust — compete (on both sides) with people she doesn’t know and doesn’t trust. And, as always, Peri doesn’t even know if she can trust herself — but she’s very clear on what she wants: out. Out of the life, out of the spy business, out of everything that defines her. To get there, she’s going to have to rely on everything that she’s trying to get away from, but that’s a price she’s willing to pay. It may be Quixotic, but it’s all she’s got (other than her cat). It is difficult to talk about the plot without giving too much away, so that’s as specific as I can get. If there was a problem with The Drafter was that it was sometimes as confusing for the reader as it was for Peri to know what was going on (I’m not saying, it was poorly written — but as things were filtered through Peri’s perception, which were pretty in flux . . .). In The Operator, we don’t have that problem — Peri’s sometimes not sure what she’s doing, or that she’s doing it for the reasons she thinks that she is — but she’s very clear about what’s going on. Actually, sometimes, I think she’s the only one who sees the whole board and understands what’s going on. Which makes everything much easier for the reader to follow. She had a clear objective, clear obstacles to overcome, and the gumption and skills to get the jobs done. The only question is: can she accomplish all she’s set out to accomplish before she’s killed or has her mind wiped? Characters — again, this is tough. I’d like to say X at first seemed like a good antagonist — if not enemy — but then Y happens and X does Z and reveals that they can be a trusted ally and possible friend. But if I’m going to do that, I might as well reveal half the plot. There are some great new character, I’ll say instead, and every one that Peri ends the book trusting/befriending, I’d like to spend a lot more time with. A couple of decent new enemies/antagonists — I think we get enough of them. The people who survived The Drafter and made it to these pages, we learn more about them and pretty much cement our appraisals of from last time out. As always, Harrison gets almost every character note right, I think I’d have an easier time noting where she fumbles on that front. If for whatever (very wrong) reason you ignore the story, this book is worth reading just for on a tiny little details that Harrison has filled this with to make a slightly futuristic future in this world. You can recognize it as our world, but it’s future-enough to be a totally new world so you don’t recognize everything. I’m not sure those sentences make sense, but you probably get my gist. I could do a post just on the future tech, culture, economics, etc. I’m not going to do that — just not enough time on my hands — but I could, because the world Harrison has surrounded Peri with is just that developed and detailed. And almost none of the details like that have any bearing on the plot beyond grounding the characters. I love that. This may not be as well executed as its predecessor, but Harrison spent so much of The Drafter setting up the world while telling the story — where this time, she just gets to play in the world and tell the story. I think I enjoyed this one more, while I didn’t admire it as much. I have a few ideas what Peri and the rest will be up to in The Agent, but I’m more than prepared for Harrison to do something better than those. All I know for sure is that it’s too long before it’s released. 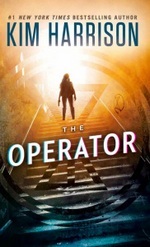 The Operator is a slick, sleek, SF adventure novel that’s sure to satisfy on several levels. Disclaimer: I received an ARC of this book from Pocket Books, and I thank them very much.